Reissues of old games tend to have one of a few goals: Remind original players of their earlier experience, re-introduce new players to something they missed, or revamp an antiquated title using modern know-how. Dragon Quest VII: Fragments of the Forgotten Past is a combination affair; released on the Playstation in 2000 (and on Halloween, 2001 in North America), the 3DS remake updates the visuals and complies to a few present-day conveniences such as a lack of random battles. The biggest improvement, one could argue, is the shift from a home console title to a dedicated portable device; this is a game meant to be played wherever you are, both in large chunks lying on the couch or in short spurts commuting on the bus. You’ll need the extra time—completing the journey can take upwards of one hundred hours. But like the latest massive entry in a fantasy book series, you’ll want to dive in again and again, and your hours spent will be rewarded. This is the first time the game will be called by its Japanese title Dragon Quest VII in the west; it was originally released as Dragon Warrior VII. The North American nomenclature is a holdover from the first game brought over for the NES in 1989 and given the more aggressive, proactive title “Warrior,” hoping it resonated with American audiences more than the vague “Quest,” with its connotations of aimless wandering (and the Matthew Modine vehicle Vision Quest, about a high school wrestler from the Pacific Northwest). And the remake highlights a particular strength of the Nintendo handheld platforms, especially the 3DS: Reinvigorating games from the past. Many consoles have been home to re-dos and renovations. But few have so leaned on not just re-releases of old favorites but from-the-ground-up reconciliations of what a game might have been had it been made in the 2010s. Arguably the first major title for the 3DS was 2011’s The Legend of Zelda: Ocarina of Time 3D, coming just months after a mediocre launch of the expensive portable. The Nintendo 64 classic looked crisp and felt smoother than ever before, not only due to the higher resolution and 3D visuals but lessons learned from over a decade of game design. This would lay the groundwork for long-time publishers to rethink the past under new parameters. But more than 3D visuals or revamped touch-screen mechanics, the 3DS has provided a bastion for older console games to be played in a modern way: Anywhere the player wants. In this way, Dragon Quest VII is an extension of what Enix (now merged with Square) has done since putting Dragon Warrior I & II on Game Boy Color, a duo of the first Famicom games in the series. Dragon Quest VII was originally released on the Sony PlayStation, making it the first Dragon Quest game to release on a non-Nintendo platform. Dragon Quest is very much a barometer of strength in Japan, its very presence on a platform an acknowledgement that this is where the players are. And there are many of them. 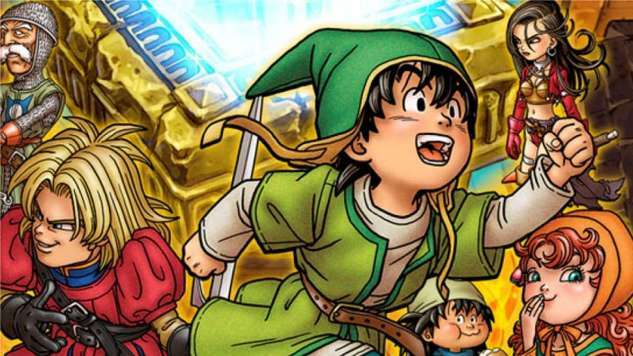 The third title’s massive popularity in Japan caused the Japanese government to suggest to Enix they release Dragon Quest games on the weekend so that school children (and adult workers) would not skip out on obligations in favor of picking up the newest title. Or so the story goes. So with Dragon Quest VII, the tides of power had shifted in the East. Yet few in America played it. Coming out years after Final Fantasy VII and its graphical embellishments and cyberpunk story ignited a passionate fanbase in the West for JRPGs, Dragon Quest VII’s medieval trappings and traditional look made it look feeble and outdated by comparison. Timing did not do the game any favors; the country was still reeling from the events of 9/11 one month prior when Japan’s role-playing titan washed up on our shore. Minds lay elsewhere. What this 3DS remake does extraordinarily well, then, is provide an opportunity to rediscover something lost long ago. The game itself is a Fragment of the Forgotten Past. That’s especially true for this reviewer. Somehow, through my three decades of playing games, I had never encountered a Dragon Warrior/Quest game. And this is a pity—known for a relatively streamlined battle system and kooky characterization of heroes and enemies, famously designed by Akira Toriyama, if there is one role-playing series that would have engendered the genre to my younger self, this is the one. From the get-go, the adventure doesn’t feel like your standard Chosen One Saves the World trope, but instead like kids roaming around their neighborhood, tromping through an unknown woods or splashing about in the nearby lake. Only here, the woods are an ancient kingdom, and the lake is a globe-spanning ocean. The plot revolves around a band of kid villagers gathering the stone fragments of the title that, when combined, open a portal to the past, where you solve the problems of villages in turmoil and towns ravaged by monsters. (Dragon Quest VII is basically Quantum Leap, with Scott Bakula in the role of a young anime boy and you playing the part of Dean Stockwell, off-screen, wielding your controller and giving him advice.) Once you succeed, you’re whisked back to the present where a series of islands emerge from beneath the great ocean. What begins as a tiny one-island world eventually expands to a giant concourse of interconnected continents. Ironically, what had once been seen as dated and uncouth in 2001 might well have worked better fifteen years later, with pixel-art and sprite-based games having made a sizeable comeback thanks to indie developers, many of whom had grown up inspired by Yoriyama’s work. The most apparent update in this 3DS revision—more fully rendered polygonal characters and environments—is what will likely make this version appear dated in the future. For the moment, your main character and friends Prince Kiefer and Maribel resemble actual humans moreso than in the original overhead sprite snapshots. And that sweet, sweet music—so good it earned its own spin-off game in Theatrhythm: Dragon Quest, which needs to come westward soon—never sounded better. One of the laments with subsequent games in the series is that they hold onto previous details like life rafts in a storm, re-using the same enemies and even sound effects over and again. This is part of newer games’ ongoing charm, of course—or at least an easy nostalgia shot for those familiar with the prior games—but for me, I hadn’t heard the tch-tch-tch of Taking the Stairs before, or didn’t know a Wyvern from a Dragonfly. Only the ubiquitous Slimes, the one unavoidable element from the series for non-players, felt recognizable. And it’s their basic biology that feels most representative of the series’ long-standing success: A shiny blob with knowing eyes and an innocuous smile that mutates and evolves over time, growing stronger without losing its essential cuteness. Dragon Quest VII is a known quantity to some, but not many. If you’re a veteran of the series, you know what you’re getting into. Me? I’m still plowing the depths of this expanding world, racing through labyrinthine dungeons, killing monsters, looking for lost villagers and sleeping at the local inn. The essential comforts are all here: the serotonin drip of Leveling Up, that slow-release of strength that baits you into pushing deeper into the cave just to see how far you can go before being ravaged; the Jobs system, where your characters take on different vocations, even non-violent careers like Bard or Dancer, to embody a range of skills and maneuvers. Those monsters—from the cape-wearing cat Meowgician to the stony and intimidating Golem—can’t be tamed as they could in prior games; instead you gather the hearts of the defeated and eventually learn their monstrous ways. If you’ve never played a Japanese RPG before, this can be a lot to take in. If you’ve gone through all ten of the mainline Dragon Quest games already and are back for more, you’ll enjoy the homecoming. Either way, thanks to this 3DS renovation, its edges smoothed with time, you’re able to chip away where and as you wish. Reminders such as “The Story So Far” descriptions are available for the forgetful among us, and the next direction to venture will often be highlighted by talkative villagers, as is the custom. Ice-covered landmasses and lava-spewing volcanoes await. Dragon Quest VII may not rewrite the history books, but if you’re in the mood to sink into a thousand page tome, and could stand to be charmed by a smiling dollop of sentient goo, you’re in the right place. Dragon Quest VII: Fragments of the Forgotten Past is published by Nintendo. It is available for the Nintendo 3DS.